A multimedia software company called Digiarty Software (MacXDVD.com) quickly responded to Apple Event in this September. 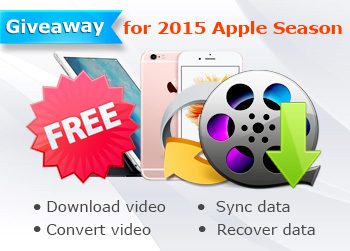 As soon as Apple released iPhone 6S, iPhone 6S Plus and iPad Pro, they rolled up your sleeves to share some informative how-to articles and launch a giveaway on three popular Mac software for all Apple, iOS, Mac computer users, including video converter software MacX Video Converter Pro, data sync solution called SyncMate and data recovery application of Disk Drill. This giveaway will last will the end of this month, namely, September 30th, 2015. From now till that date, you can head to the following page to get the software of your interest and read some Apple related how-to scenarios to solve the everyday problems you might have when using your Apple device and computer. Built in over 320 video codecs, this Mac video converter (Mac OS X El Capitan supported) is capable of converting nearly any kind of Ultra HD, HD and SD video files to the format, parameter and size that you need. Has the unique feature to download 8k,4k,1080P,720P online videos, MVs and songs from more than 300 video and/or music sharing sites, the most renowned YouTube, Facebook, Dailymotion, Vevo, Vimeo, Metacafe are included. Preconfigured with a greatly variety of mobile device profiles, MacX Video Converter Pro can convert all videos to the suitable format that can be transferred and played on any phone, tablet etc. No matter if you are using iPhone 6S, iPad Pro/Mini 4, Android phone or tablet, you will not worry about the format incompatibility issue. Can even work as a basic video editing solution to edit videos and capture on-screen activity. You can now merge multiple videos to one file, trim the video length, crop unwanted parts in the video, or add watermark to it. Sync Mac with multiple iOS/Android devices simultaneously. Sync folders, music, videos, images, contacts and more. Recover files from Mac, external device, memory card etc. Recover any deleted or lost files/videos/documents/photos etc. Owns several data protection features. Never lost data again. How to Get These Three Mac Software for Free? To grab the above three Mac software, go to the software giveaway page at https://www.macxdvd.com/giveaway/mac-software-giveaway-and-tips.htm and you only need to submit your email address to the green message box beneath each software, and then click “Get License”. A popup window will open immediately, showing you the software license key and download link. If you do not want to miss it, remember to visit that giveaway page before Sep 30.